Sugar needs to be reduced in our diets in order to achieve weight loss goals and overall health. When we see sugar listed on food labels, we tend to get turned off and, hopefully, opt for something else. But how is this affecting sales of products with sugar listed in the ingredient list? You guessed it, sales are declining. So let’s think like a marketing agency/manufacturer for a second. How else can I get consumers to buy more of my product without having to change any of the ingredients (because that would be too much work, right?)? Oh, I’ve got it! Let’s give it a new name! Food manufacturers are choosing a “healthier” name for good, old-fashioned sugar. May I introduce to you, evaporated cane juice…. That’s right, you heard it correctly. They took 3 words to say sugar, yet it sounds so much more sophisticated and, in the eyes of the consumers, healthier. It is nothing more than cane sugar. It contains the same amount of calories and yields no greater amount of nutrients than cane sugar. 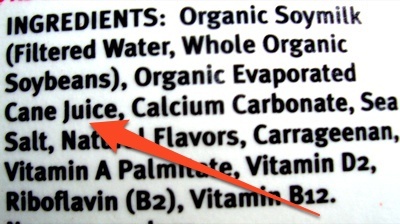 The only difference is that evaporated cane juice originates from sugar cane, not from beets. Sugar derived from beets is usually genetically-modified, but sugar cane is not. Manufacturers could just list sugar cane instead, but evaporated cane juice sounds “healthier”. The FDA has acknowledged the use of this term and its potential to mislead consumers, but has failed to mandate any regulations on its use on food labels. Due to the lack of regulation, lawsuits have been filed for misleading claims, but unfortunately not much can be done without a formal regulation. The FDA did state that they may be changing their minds on the matter in the near future. So for now, just continue reading those food labels. I don’t think I can say it enough. It is the best way for you to stay informed. An informed consumer is a savvy consumer.